When I came across this dated art at the thrift store last week, I knew just how I wanted to use it. It's the perfect size for this adorable bunny card Ginger Grand picked out for me from their family honeymoon in England. Of course, the frame would need a simple upcycle. I started by removing the paper backing and art from the frame. 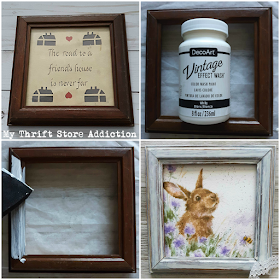 I received Vintage Effect Wash as a member of the DecoArt Blogger Outreach Program. See full disclosure here. Isn't he the cutest? I love the soft colors and the bunny's sweet face. Did you notice the little bee in the bottom corner? 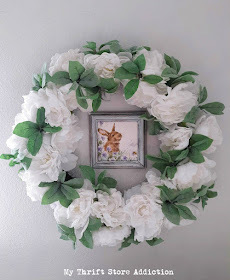 I decided to display my whimsical bunny inside the white floral wreath I scored 75% off on clearance after Christmas. Since I already had the bunny art and paint, I only spent .25 on the frame! 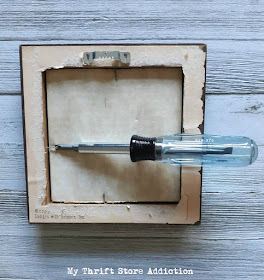 Click below to visit the other Thrift Store Challenges! Just love it Cecilia. I love to frame greeting cards too. Your little bunny card is precious. Great job on updating the frame. Happy Spring. I often frame cards as part of seasonal decor, and I love your idea of using a wreath to highlight it. Great idea!! 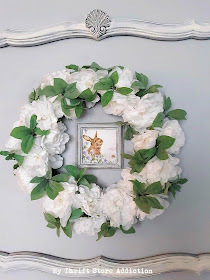 Cecilia your bunny frame is such a cute decorations for any season but looks adorable in the wreath. I love that print. I will have to go check out the site where you got it. 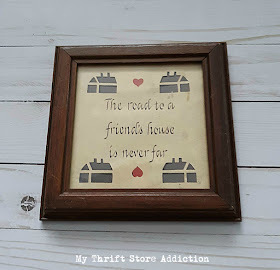 Thanks for sharing your thrift store find with our challenge. Have a great week my sweet friend. Ginger Grand will be so pleased you framed his card. That picture is so Eastery/springy. Among my errands this a.m., I needed a GW fix and came home with an impressionistic mother and 2 kids--right color tag. Will join my Monets in the bathroom! Gotta love art on the cheap! 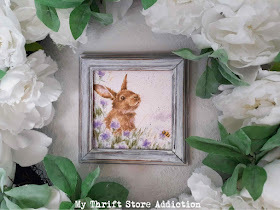 I love the darling little bunny card that you framed. So sweet! And the way you displayed it was adorable too. 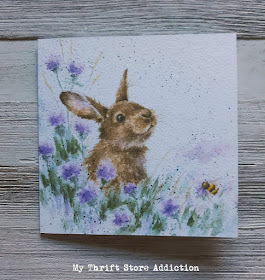 I have no doubt in my mind as to why you are addicted to thrifting. Right there with you, friend. Thanks for joining us! 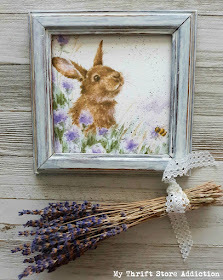 Love your Rabbit print, so perfect for Spring and Easter! The frame turned out fabulous! I haven't seen that paint before but will be looking for it soon. That bunny is so cute! And the upcycled frame is perfect for it. Darling and 15 minutes crafts are just my style! O MY!! This is absolutely adorable!! I love it!! Thanks so much for stopping by! !